Being relatively new to Mountain Bike racing means that the Highland Fling was one of the few races I have had the opportunity to do twice. Still racing in the age-group categories, my 2014 Fling didn’t exactly embody the best memories – I crashed twice, “bonked” badly, vomited under a tree at the top of Brokeback Mountain and limped across the line 6 hours and 20 minutes after I had started. Coming in to 2015, the score was definitely Highland Fling 1, Briony 0. Even with my recent good form and some big names pulling out in the weeks leading up to the race, my only objective for this year was to make amends for my past attempt and to simply finish this tough, gruelling and demanding race in one piece – ideally in considerably less time. The elites lined up on the start line and were let go, like a pack of hungry hounds, 15 minutes after the rest of the 100km and 100mile fields. The chase was on! I was expecting a fast start and while it wasn’t on from the whistle (or in this case, the bagpipes), there were certainly some surges early from the likes of Andy Blair, Kyle Ward and Anthony Shippard (or at least I think they were the culprits – I was busy chewing stem trying to hang on). Myself, Eliza Kwan and Lucy Bechtel remained with the elite men into the first lot of paddocks, but found ourselves on our own after the first major hill attack. Regardless of the fact we were now separated from the men, there was no easing up on the pace as we hammered through the first of three sections (a nice way of getting to know each other). I did express a little bit of concern when Eliza queried whether the first river crossing was “rideable” – thankfully she dismounted and waded through the waist deep water, bike above head, before that story ended like the Titanic did. The three of us also earned a fair few cheers from other riders as we slipped and skidded through the first long muddy section (many had given up and were walking through the ankle deep slush). I think this was also the point Lucy officially gave up on trying to keep her new bike clean. Disaster was on the cards for me from the first transition stage where I simply couldn’t find my second bottle. I spent all my time looking for it and upon noticing Eliza and Lucy leave, hit the road again without even filling my half empty first bottle. The resulting time trial down the road into Wingello to catch them wasn’t ideal either, even if I did get to witness a good friend of mine fall off right in front of me (he was OK, so it was OK to laugh!) Commentators didn’t have to wait long until the next fail, where I missed a turn into single-track, regardless of the fact Lucy yelled “Right” about 17 times. Once again, cue a 3-4 minute time trial to get back to the girls. Eliza’s strength riding single-track was immediately evident as she gracefully slipped through the trees, like Michelle Kwan on a frozen lake. Given they have the same last name, I was immediately amused with my comparison and promptly hit a root the wrong way. Pay attention Briony! Come the first real climb (the King of the Mountain section from 3 Ring Circus), it also became quickly apparent that we had a climber with us, as Lucy shot up it, leaving Eliza and myself clinging to her wheel in utter desperation. Over the top the three of us went. The group of three girls was eventually broken as we hit the notorious “Wall” – a relatively short but steep and loose climb with a good scattering of riders pushing their bikes up. To her credit, Eliza cleared it, leaving Lucy and I chasing after coming unstuck in the traffic. We pressed on through a stack of twisty trails to the awesome new(ish) section “Love Love Love”, where I was promptly dropped on the resulting climb (after deciding trying to hold Lucy’s wheel was probably going to end badly for me later on in the race). Halfway Hill was no different to how I remember it (hell). Just when you think that’s done, you run in to more and more climbing out the back of Wingello (just for something different). While I was worried about the potential time I was losing (I felt like I was going backwards at some points), I banded together with a familiar face from Sydney and started picking off riders. Thankfully it was an overcast and cool day, which meant that although I was aching for a drink, I didn’t feel too dehydrated after doing 3 hours on one bottle. With my bus driver hat on, we towed a group into the transition to commence stage 3. I think I probably consumed over 2 litres of fluid at the second transition and felt better almost immediately. As most of the 100km riders would probably acknowledge, once you have completed the Wingello stage, it feels like the Fling is almost over. It is easy to forget how tough the final ~30km is (I certainly made that mistake last year). As deceptively hard as it is, it is also quite enjoyable, as you cross a Golf Course, Winery, some amazing private land and through some great single-track. On my own for much of the final section, I focused on catching riders ahead of me to try and make up some time. In the end it wasn’t quite enough, as I came in roughly 3 minutes behind Eliza in second, who was around 4 minutes behind the rightful winner on the day, Lucy Bechtel. Big congratulations to both those girls! 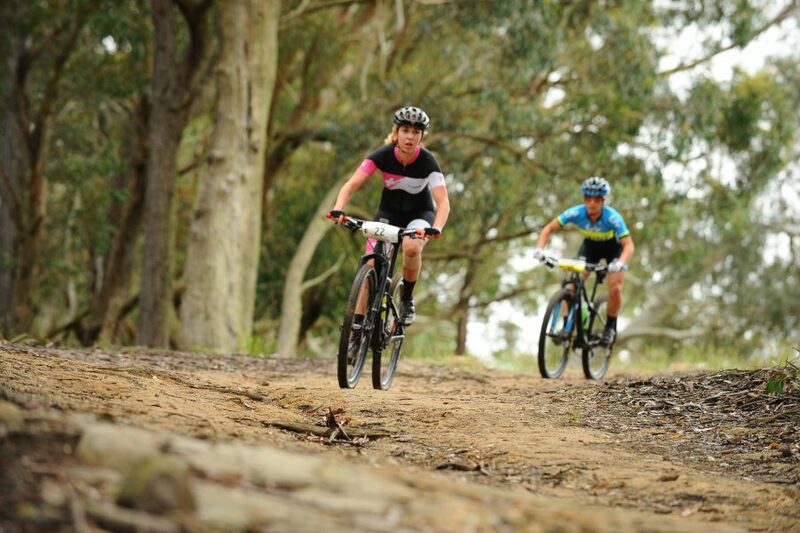 The Highland Fling is such a great race to be a part of – it has a bit of everything in terms of terrain, is extremely well organised and is heavily supported by the local communities of Bundanoon, Wingello and Penrose (to name a few). It’s quite humbling that local property owners are willing to have hundreds of mountain bikers fly across their land each year and even more fantastic that most of them come out and support you as you ride past. As for the single-track at Wingello State Forest – it’s always a pleasure. Make sure you get to “The Fling” next year! P.S – The score is now Highland Fling 1 – Briony 1. This year I managed to knock over 40 minutes off my time and erase some very dark memories. Until next year at least!